Jackie crushing some rope climbs! Steady effort on todays AMRAP. Break the push-ups into manageable sets. Hold on for big sets on the KB. Make your case in the comments. April Vacation Kids Fitness Classes is rolling! If you are interested in signing your child up, or are looking for more information, please email Brian at brian@crossfittilt.com. New article by Coach Kathleen. Equinox Miami – Metalbeard: 3 rounds (53# for 70#). Assault type bike – super tough to get cals, 3.5 minutes on the bike each round. 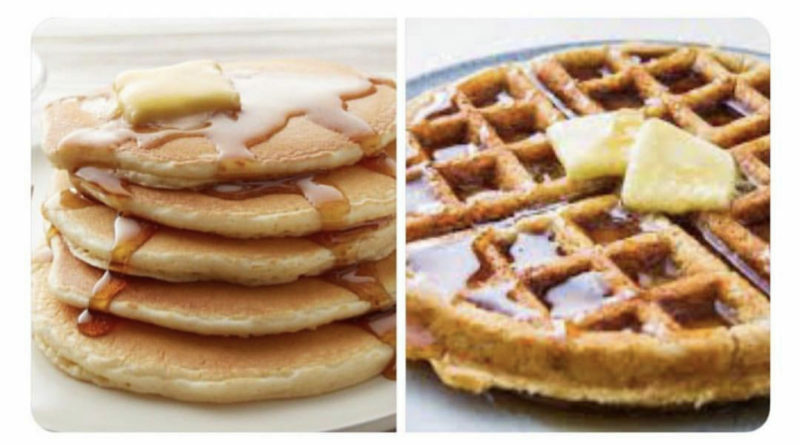 QOD: hands down, without a doubt, waffles. Want more waffles? Teen Titans Go! Because 1. I enjoy making them, and sharing them with others. 2. Because those little squares hold whatever you choose to top them with (maple syrup, blueberries, jam, almond butter……) you can make them more savory or more sweet depending on what you’re feelin’. 3. Need I say more? Who wants some waffles? Lindsay? QOD: without a doubt, waffles- it’s all about the crevices. I like a little peanut butter w/ real maple syrup. WOD: tough one but waffles because the finest made waffle wins over the finest made pancake and the bottom of the barrel waffle wins over a bottom of the barrel pancake. And because you can’t eat fried chicken and pancakes, that would be weird. 1- You can put fruit, chocolate, sprinkles, etc in pancakes. Not so much or as good with waffles. QOD: Well, I originally thought pancakes, hands down, but the chicken and waffle argument is strong. OMG, I want to come back as Jeffery in my next life. QOD: pancakes! They stack so easily and it’s easier to spread things on them. QOD: Pancakes, preferably Buttermilk with freshly picked Maine blueberries in the batter, real maple syrup and butter. Post training meal back in the day. Waffle with syrup, then egg with mustard on top. Yes, mustard. Tangy and sweet. QOD: a good Belgian waffle is hard to beat, particularly with fried chicken on it. Breakfast of champions. QOD: Waffles, for all those reasons and because pancakes no matter how fluffy are just never as crunchy and fluffy as a good waffle. QOD: Waffles. If you like pancakes you’re a cereal killer. Waffles because the crunch and crevices for syrup! Also, Bacon > sausage. QOD – Pancakes, pancakes, pancakes. Put a big post on Facebook today about pancakes but here’s the real story…growing up my dad used to make pancakes on the weekends. They were these super thin almost crepe like pancakes and he would serve them with yogurt, mandarin oranges, plain yogurt, wheat germ, and maple syrup. I don’t know, whenever I think about pancakes this is what I think about. QOD: I think I’m gonna have to say pancakes, I do love waffles though.